The 25th annual Texas Instruments Annual conference started today, and after an inspirational opening by Leland Melvin, I was eager to get to my first session on the new Nspire iPad app. I think I am currently in my “stubborn” stage…refusing to pay to buy this until I understand its worth. So, for now, I will sit back, try to learn, and gauge the reaction of the room. The app is currently “on sale” at a price of $4.99, which is $25 off the regular price. Whether the regular price is way to high, or the sale price is too low….I’m not sure yet. The icon for various page types (calculator, graphs, geometry, etc) will be familiar to those who have used the Nspire computer software. Also, a short introduction / tutorial is provided, but what fun is that? Today’s presenter was Andy Kemp, who led us on an hour-long tour of the features of the new app. 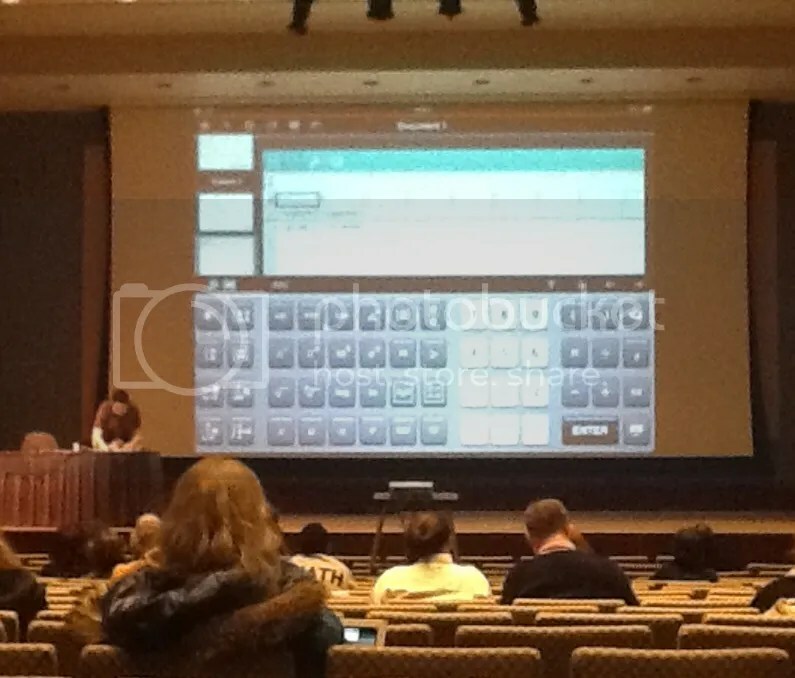 A math keyboard is provided, and seems to be designed to have a different look and feel than the standard iPad keyboard. Templates for things like fractions, matrices and derivatives seem to be intuitive. Also, some buttons can be held and pressed to give extra functions. Holding down the cos key will give a menu for sec, and their inverses. “The ability to move the graph around with your fingers and manipulate it is what is fundamentally different”. The function rule will change as the graph changes. This is nothing much different than the handheld, but the transformations are much smoother with the ability to drag with fingers, rather than using the closed hand tool. A variable button allows us to recall previous functions, and use them to create new functions. I do appreciate and like how the sliders work on this app. The slider box can moved and resized much more easily, and the settings can be changed by holding down on the slider box. Also, the animation feature is much more obvious and easier to implement. Here’s what I don’t quite understand. To find roots of a function, TI still wants me to identify a lower and upper bound, after which it will then search for roots. This, to me, is not as convenient as the Desmos calculator, where landmark points are identified easily, and can be turned off if I like. Not sure I understand TI’s obsession with requiring boundary selections. My first impression is that I would use this more than the teacher software, which to me is often clunky and slow. I like that I can create files which can feature graphs, data, and functions. And TI continues to update its arsenal of activities and files. So, eventually, I will probably relent and purchase the app for my ipad. I was at this session & it was much more valuable to me than the webinar by TI for the app last week. Bought the app at the reduced price for myself. So far it is faster than the handheld, my daughter likes it & it will save my eye sight. Worth $4.99. Not sure yet if it is worth $29.99. Besides the fact that you can’t use a tablet or smart phone in standardized testing situations, why would any student/teacher choose to by a handheld anymore if you can get a better experience through an app?